Lately, I’ve had the occasion to think about landlords, tenants, rents and ownership. Which brings to mind this wonderful unpublished poem by someone named Margaret Halaska. Pilgrim Dad and I went on a contemplative retreat recently and this was given to us as one of the readings. I don’t want to rent. I want to buy, says God. I like it, says God. I’ll take the two. You might decide to give me more some day. I can wait, says God. but it’s a bit difficult. I need some space for me. I know, says God, but I’ll wait. I like what I see. Hm, maybe I can let you have another room. Thanks, says God, I’ll take it. I like what I see. Think on it, says God. I wouldn’t put you out. You’d have more space than you’d ever had before. You’ll have to discover it for yourself. Top-Secret Message? Try Lemon Juice. Athos saw this in a magazine and had to try it. The effect was quite nifty so I thought I would share it here. Ours isn’t much of a lemon juice kitchen so we had to go out and get some. I squeezed the juice out, strained out the pulp and seeds, gave the kids some brushes, and let them have a go at writing and drawing whatever they wanted. The tricky bit is getting used to the idea of drawing without seeing anything. The natural response is to keep adding more juice, just in case, creating a very wet piece of work. In any case, the result is wholly invisible. Let it dry, and if you want you can even get the kids to write over the paper to enhance the “secret message” effect. When you’re ready to reveal the message, pop the paper into the oven for a few minutes, or run a hot iron over it. The juice will brown and become visible. That’s like a temptation-in-the-wilderness question for me. Saying “yes” is ridiculously easy, and guarantees me at least 30 to 60 minutes of household peace and quiet to do whatever I need to do without interruption. But I can’t shake off the feeling that it’s the second-best option, and where possible, I try to have standby alternatives for the kids. 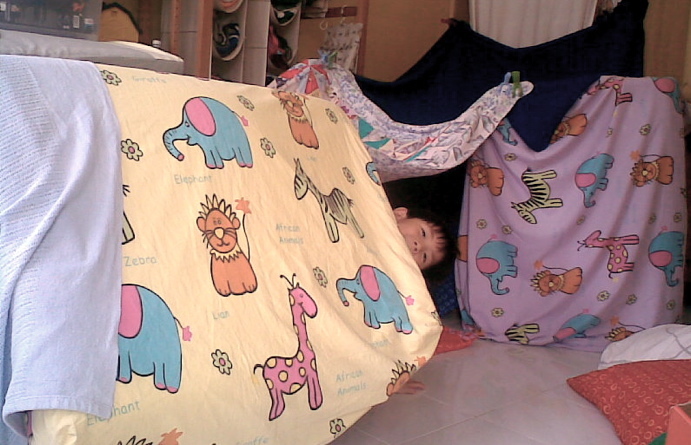 So when the question came yesterday, I had to fight off the urge to say “yes” (a nap would have been so delicious…), and instead activated one of the simplest and most low-cost activities – building castles and fortresses with the household bedding and bedlinen. I remember doing this myself when I was a kid, and if you give the kids lots of raw materials to work with, they’ll enjoy it too. 1. Do this on or just before a bedlinen laundry day. That way you won’t get stressed if the kids trample and sweat all over the sheets. 2. 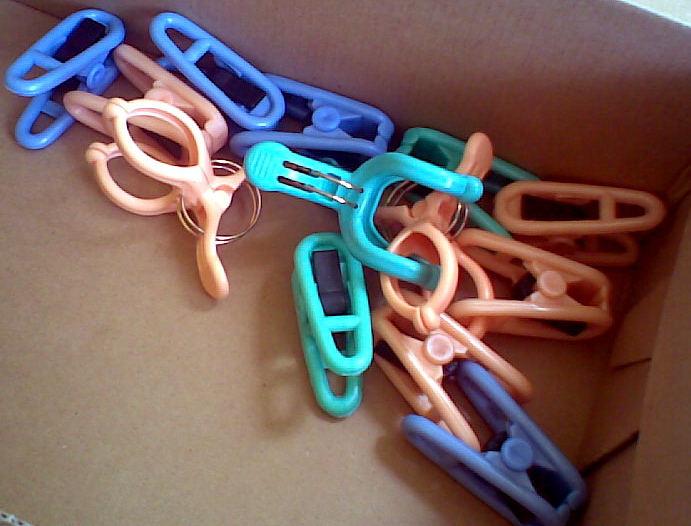 Buy and set aside clothes pegs (both big and small) just for this activity. Otherwise, don’t be surprised if your normal laundry pegs mysteriously disappear over time. The ones on the left are about $2 a pack from NTUC Fairprice, and have rounded edges which make them safer for kids. 4. Make sure the children are old enough for this activity – some possible risks are suffocation under a pile of blankets, or clipping sheets to unstable furniture (e.g. lamps) that might topple over. If you aren’t sure, be on hand to supervise. Here is Porthos peeking out of the castle we built yesterday, out of four mattresses and three blankets. Whee!